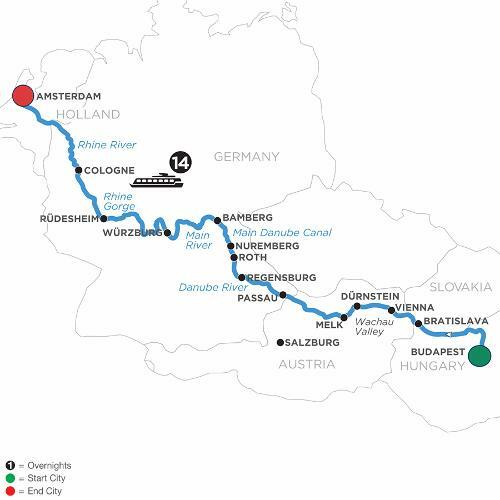 Alternatively, in your free time take a bicycle and a picnic from the ship to explore the local sights along the Danube. DISCOVERY Join your Beer Expert on a tour of local breweries. You may also take a tram to Austria’s Prater amusement park or to one of the many museums nearby. Later, consider joining an Optional Excursion to attend Royal Waltz Concert in an elegant hall. Alternatively, you may join a full day Guided Optional Excursion to Salzburg, the city of Mozart, or a full day Guided Optional Excursion to the picturesque Bohemian town of Cesky Krumlov. You may choose to join a Guided Optional Excursion to the Benedictine Monastery in Weltenburg. DISCOVERY Enjoy an onboard beer lecture hosted by your Beer Expert. DISCOVERY Enjoy a beer in a local brewery after your tour. Later, enjoy onboard entertainment as you cruise to Rüdesheim. Start the day with a Morning Stretch with your Avalon Adventure Host after an early sailing to Cologne. DISCOVERY Enjoy an onboard cheese and beer tasting hosted by your Beer Expert while sailing to Amsterdam. In the afternoon you may join an Optional Culinary Walk through Amsterdam to sample savory and sweet Dutch specialties. Or choose an Optional City Biking Tour to discover the countryside. You might also consider a Guided Optional Excursion to Zaanse Schans to see historic windmills and charming Dutch houses. Day 13 Cologne: choice of Cologne highlights walking tour, or Jewish Heritage walking tour, have a Kölsch in a local brewery; onboard beer and cheese tasting; food & beer pairing dinner on board. From Budapest to Amsterdam, you’ll be immersed in the culture of Central Europe, as well as its beer and brewery traditions, on this European river cruise vacation. In Budapest, Hungary; Bratislava, Slovakia; and Vienna, Austria, a Local Guide will show you the must-see sights in each city, and you’ll have plenty of time to explore on your own. See Heroes’ Square in Budapest, Bratislava’s Old Town with its winding streets, bronze sculptures and hidden microbreweries, and stop in a classic Viennese café for a decadent treat or to sample Austrian beers. Sail through the picturesque Wachau Valley and the dramatic Rhine Gorge. Visit Melk’s mag-nificent Benedictine Abbey and Würzburg’s baroque Bishop’s Residenz. Explore quaint towns like Dürnstein with its blue and white baroque Stiftskirche; Passau, known for its narrow cobblestone streets and the stunning St. Stephen’s Cathedral; and Bamberg, with its town hall and its great variety of beers. Enjoy guided walks in historic Nuremberg, Würzburg, and Regensburg. Visit the charming Rhine Valley town of Rüdesheim with its famous cobblestone Drosselgasse lined with shops, restaurants, and lively taverns, and spend time in Cologne, Germany—a 2,000 year-old city known for its gothic architecture and for the Kölsch, its local beer. You’ll explore Holland’s lively capital of Amsterdam to see the treasures of this 700-year-old city from the unique perspective of a canal cruise. Take the opportunity to taste delicious Dutch beers. A Beer Expert trav-els with you on this cruise and will hold lectures, tastings, and will introduce you to food and beer pairing as well. Prost!